Why is it that when you sit down to enjoy a nice glass of Pinot Grigio in the summertime, you're instantly inundated with a swarm of little hovering guests? What about the utter nuisance of mixing a salad with balsamic vinegar, only to have to swat away these uninvited pests every few seconds? Fruit flies seem to come out of no where, and they arrive in droves. Why are they only around in the summertime, and what risks do they pose? Keep reading to find out the answers to these questions, as well as so much more information about these fascinating little insects. Where Do Fruit Flies Come From All of a Sudden? Where Do Fruit Flies Lay Eggs? 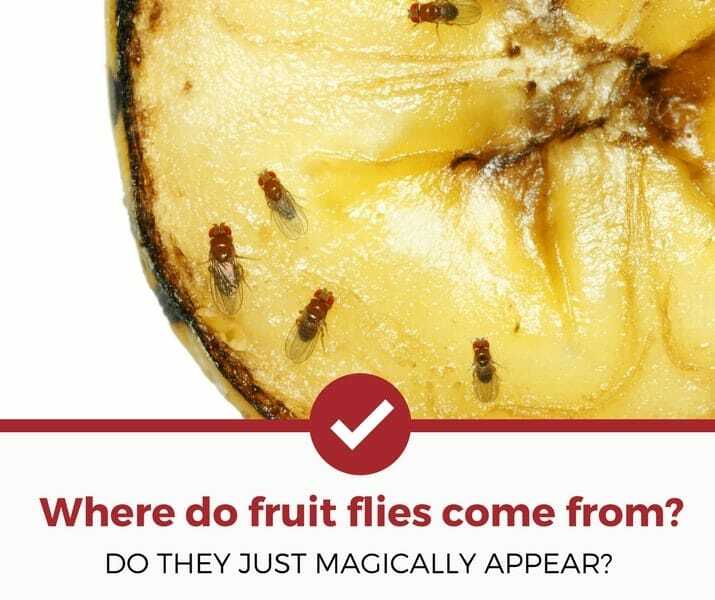 How Do Fruit Flies Form? Where Do Fruit Flies Hide? Is It A Fruit Fly Infestation? The Bottom Line about Fruit Flies! We know that fruit flies thrive in warmer temperatures, but how is it that they seem to just appear? Whether it's through cracks in your walls, or pre-laid eggs inside of a piece of fruit from the grocery store, fruit flies will find a way inside your home. There's a lot to unpack in order to answer this question. Keep reading below for crucial facts about the life of a fruit fly, so that you can figure out how best to see them coming. From the egg to the end of adulthood, a single fruit fly lives for about a month and a half. First, a cluster of eggs is laid after an adult female fruit fly mates. The organisms which emerge from the eggs are called larvae, and these are immature fruit flies which still have some development to do. In order to make this happen, the larvae will feed on the organic matter (otherwise known as your fruit) to store energy for a few days, and then migrate to a dark and dry place to enter the pupae stage. It's difficult to spot this happening, since it usually takes place in a small crevice where humans can't reach. After about a week in the pupae stage, the fruit flies will emerge as adults after having grown wings and six legs. They will then return to a source of energy (again...your fruits and vegetables) and feed; the females begin to lay eggs, starting the life cycle all over once more. Want to skip all this research and just hire a decent exterminator for your pest problems? Fruit fly eggs are most commonly found embedded in the meat of decaying organic matter or on the surface of overripe fruits. The juices saturating the fruit or organic matter serve as an energy source for the fruit flies, and they slurp it up through a mouthpiece in order to feed. It's almost impossible to be able to see fruit fly eggs, which means that there's a good chance that you could be accidentally ingesting them each time you eat a fruit! By making sure to throughly wash your produce, you can significantly reduce (and quite possibly eliminate) this risk. It may seem like they just pop up out of nowhere, but Dr. Jim Fredricks, Chief Entomologist for the National Pest Management Association, has the inside scoop on where these guys actually come from. The transformation between fruit fly larvae and fully-matured fruit flies is impressive. While larvae hatch from their eggs as gelatinous globs, they undergo rapid conversion to adult fruit flies with full motion, flight ability, and sight. Larvae will fill up on nutrients and then make a journey to a dark place where they can undergo their metamorphosis undisturbed. Outdoors, this usually takes place in a layer of soil. If fruit flies breed inside a home, they'll either pupate in the soil of a potted plant (if available), or find a small crack in which they can sequester themselves and develop safely. So, the life cycle of the fruit fly is pretty clear now. But why is it that you really only see them in summer? What happens to the fruit fly population when it's cold outside? Because fruit flies don't have teeth, they rely on liquid to energize them. Their brains can sense fermented fruit from literal miles away, so they'll always been drawn to sweet items found in nature. Think about it: every time you unload a farmer's market haul in your kitchen, the fruit flies just seem to instantly appear. When you're enjoying wine on a summer night, it's only a matter of minutes before the fruit flies start buzzing around the rim of your glass, desperate for a sip. As an outlier from most species in the animal kingdom, fruit flies are actually attracted to the scent of vinegar. The reason for this is because fruit, vegetables, wine, and fermented, decaying organic matter are the primary sources of nutrition for the fruit fly. So, in merely having these regular, everyday items in your home, it's almost like sending out an open invitation for these pests to make themselves right at home. Take a quick look at what Zoo Montana has to say about the attraction fruit flies have for wine, vinegar, and other fermented fruit beverages in the video below. But Where Are They During the Cold Months? If you're thinking to yourself that you only seem to encounter these bugs during summer, you're right. It's a pretty widespread assumption that adult fruit flies simply die off in the cold, and unhatched eggs are simply frozen in preservation until the following spring. This actually isn't too far from the truth. A 2006 study confirms that fruit flies undergo a process called diapause, which is essentially the insect version of hibernation. Growth is arrested at each stage of the life cycle, freezing the species in time until it's warm enough to be active and feed again. Okay, But Where Do Fruit Flies Lay Eggs In a House? If you recognize that fruit flies operate in a rapid pattern of quick breeding, you'd be correct. The best way to understand how fruit flies can remain in your home is to understand where they might be laying their eggs in the first place. Since the larvae which hatch from the eggs need to have easy access to nutrients (to aid in their development), it's imperative that the eggs are laid directly on or very near to organic matter. Usually, fruit fly eggs sit on top of a piece of produce or flowering plant. Okay, so you've got tiny bugs zipping around your kitchen. Just because they look like fruit flies doesn't mean they necessarily are fruit flies. Check out the sections below to learn how to identify the fruit fly among its insect cousins. They're both small and they both fly. Those statements can be said of both the drain fly and the fruit fly, but the similarities pretty much end there. Drain flies have smaller, more compact bodies and wings which span out like that of a moth. Their main identifier is the patch of fur on their heads, which can be seen by the naked eye if you look close enough. While drain flies will hover around rotting vegetation in a pinch, they're more interested in dank, damp spots like sewers, animal waste, and—you guessed it—drains. This is where most people get confused. Most people will mix up these two insects, and toss the two names around interchangeably. Fruit flies and gnats have a few similarities, but their differences are stark. For instance, some gnats will bite humans and pets. This isn't true of every type of gnat, however, it's one of the main disparities between the two insects. As stated above, fruit flies lack the ability to bite anything, let alone a human. Also, these insects have completely different body types. Gnats are smaller than fruit flies, and have black bodies that look like shrunken mosquitoes. Fruit flies have the body of a small fly, and are fully brown with red eyes. If you're finding a tangle of fruit flies hovering around your bedroom, chances are that you're going to be pretty shocked. Normally, fruit flies only live near fermented food sources...so why would they be hanging out in a room far from the kitchen? Well, it turns out that there are a few attractants in a bedroom that can draw the attention of a colony of fruit flies. Most commonly, the culprit presents itself in the form of a fresh flowering plant, or bouquet of flowers that are just beginning to wilt. Other times, fruit flies may be attracted to a drink spill that wasn't cleaned properly. The common fruit fly won't bite you. So really, what's the risk? Are these insects as harmful to humans and pets past just being plain annoying? Are Fruit Flies Harmful to Cats and Dogs? It's logical to make the connection between household pests and parasitic pests burrowing into the skin of your pet's fur. After all, fruit flies burrow into your fruits for nutrients, why wouldn't they hop onto your pet for feeding? Well, the difference between fruit flies and parasitic insects like ticks and fleas are substantial. Ticks and fleas can't fly, whereas fruit flies have the action right in the name. Also, fruit flies don't subsist on blood, as parasitic insects do. Are Fruit Flies Harmful If Eaten? This is a common question when you're dealing with food-borne insects. While no one is intentionally trying to eat a fruit fly (we hope), it's a logical thing to wonder. Fruit flies love food that's beginning to rot, so they are carriers of bacteria. Just like houseflies, the germs from previous destinations are always present on the body of a fruit fly. While it's unlikely that a fruit fly will zoom straight into your mouth, or even remain present on a fruit that you're in the process of eating, it's not unheard of to eat fruit flies on a regular basis in the summer, purely by accident. Unfortunately, many people don't wash their fruit as directed, which means that they're potentially ingesting hundreds of fruit fly eggs, completely unbeknownst to them. Are Fruit Flies Harmful to Babies? Anyone who has had a baby themselves (or simply known a person who has become a parent) understands the process of baby-proofing the home, the car, the yard, and really, their entire life. It's natural to assume that even the slightest variable could wreak havoc on your baby's small body, even if it's no more dangerous for an adult than an infant. Fruit flies are one of those things. Your baby won't have any adverse affects to the presence of fruit flies that the parents or older siblings wouldn't experience themselves. That being said, fruit flies are gross. They lay their eggs in your food, their maggots feed on the same fruit you want to eat, then they fly around your place spreading their bacteria. It goes without saying that this isn't the kind of environment you want for yourself, let alone your baby. While it may seem daunting to always be on alert to stop fruit flies at their source, it's what needs to be done. You won't stop eating fresh produce, a nice glass of rosé is refreshing in the summertime, and vinegar is an excellent cleaning agent. You shouldn't have to rearrange your lifestyle to accommodate the whims of a colony of fruit flies. In this article, we've outlined the reasons for the sudden outbreak of fruit flies so that you can be better prepared to handle them if they do make a surprise visit to your home. Curious about other fruit fly articles? Check out our other detailed guides to help you deal with your pest problems.